The bold colors and thought-provoking cultural commentary that infuse the artwork of Emory doctoral candidate Fahamu Pecou will find soon find a new audience — thousands of Atlanta commuters. Pecou, an Atlanta artist-scholar about to embark on his fourth year of PhD studies in Emory's Graduate Institute for the Liberal Arts and Laney Graduate School, has been chosen to create a series of large-scale murals at four regional stations of the Metropolitan Atlanta Rapid Transit Authority (MARTA). The project is being coordinated through WonderRoot, an Atlanta-based non-profit arts and service organization that unites artists and communities to inspire positive social change, Pecou says. The community-based artwork will be part of "En Route," a public art initiative sponsored by WonderRoot, MARTA and the TransFormation Alliance. The project seeks to invest in public art "as a tool for community organizing and placemaking," Chris Appleton, executive director of WonderRoot, explains in a prepared statement. The project is funded through a $50,000 grant from the National Endowment for the Arts' "Our Town" program in partnership with Fulton County Arts and Culture, with additional support from the Georgia Council for the Arts. Pecou has been selected to create "meaningful, aesthetically imaginative, high-quality, text-based murals that explore issues of access, mobility and public transportation" at four locations throughout the rail system, according to Appleton. The first mural will be created at the King Memorial MARTA Station, followed by the Oakland City MARTA Station, Hamilton E. Holmes MARTA Station, and a final station to be designated at a later date, Pecou says. "The express goal is not only to enliven the stations with original art, but to create art that engages with residents as well as the larger community that these stations are in, inspiring and highlighting social concerns," he says. "Putting it into a public space, allows me to have a conversation about agency and mobility and thinking about transportation and connectivity within the city," Pecou adds. "I'm really excited." Pecou envisions the project as providing "a kind of visibility into communities that are often marginalized," he explains. "I think that's why those particular MARTA stations were chosen — so the people in these communities can be seen and heard in ways they haven't traditionally been seen and heard." Before beginning work on the murals, Pecou plans to host a series of community dialogues about each project. He will begin the King Memorial Station mural first, with hopes of finishing by late winter or early spring; subsequent murals will be completed on a rolling basis. The artist says he's looking forward to the challenge, which will draw upon both community interactions and his own scholarship. "My work has always tried to engage the public, but in this instance it's actually being done in a public space, as opposed to a gallery or museum," Pecou says. In recent years, Pecou has made a name for himself as an up-and-coming visual artist who blends his observations on hip-hop, fine art and popular culture, with a particular focus on the contemporary representation of black masculinity. His work is featured in national and international collections including the new Smithsonian National Museum of African American Art and Culture, now under construction in Washington, D.C., Atlanta's High Museum of Art, and Societe Generale in Paris, among others. "One of the things that the Emory program has done for me is to challenge my thought process, not only how I'm receiving information but how I can translate it into bodies of work," Pecou explains. "I look at this project as not just a series of murals, but a work that must be conceptually engaging and inspired by issues that may come up in dialogue with these communities," he says. "Then it becomes a teachable moment, a form of public scholarship." The MARTA project expands an already busy schedule. This summer, Pecou attended a sold-out showing of his work at the Backslash Gallery in Paris. 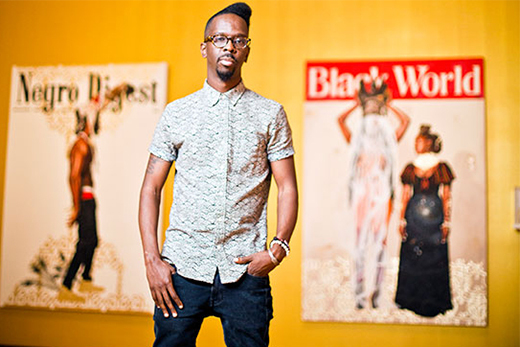 He has also been curating "Rites," an exhibition featuring the work of four artists built around the rites of passage of black men, which opens Aug. 22 at the Zuckerman Museum of Art's Mortin Gallery 3 at Kennesaw State University. This fall, he will also be teaching "Mad(e) Men," an interdisciplinary class offered at Emory that examines ways in which visual culture and the U.S. media have shaped perceptions of black masculinity.